Weather in the Rockies is an interesting thing. The extremes between seasons are dramatic and can whipsaw quickly. In fact, in my sixteen years of living here on the Front Range of Colorado the entire concept of there actually being such a thing as seasons can seem downright laughable at times. How many places in the United States can one wake in the morning, clear a foot of snow of their car, start it and have the air conditioning still blasting full force from the previous days warm temperatures? As I write this, I’m staring out my window at trees with vibrant greens leaves of spring. The issue of course is there is a good six inches of snow covering the leaves and branches of said tree from last nights storm, and oh yeah, the snow is still falling. I’m not complaining. Bad weather makes for great images and as the saying goes, when the weather gives you lemons, you need to make lemonade or something to that extent. While there was still a good amount of snow hanging around the higher elevations of Rocky Mountain National Park, spring like conditions where quickly starting to settle in. Lakes and streams in the lower to mid elevations of the park had thawed and are free from ice. In fact many of the lakes even at higher elevations had thawed to the point of having large areas of water free from ice. It’s an exciting time of year when winter starts to release it’s grip and new opportunities for photography open up. 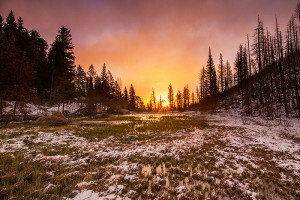 So with a large spring snowstorm bearing down on Rocky Mountain National Park, I decided to head up to Cub Lake for sunrise before the snow really started flying. It’s always impressive to watch the weather conditions transform as a storm system moves over the park. The high peaks of the park are enveloped in with clouds, snow begins to blow over the continental divide and the wind begins to pick up. Not necessarily the best conditions for photography, but conditions that may at least lead to some drama in the sky and over the peaks. With the wind howling, and snow blowing I arrived at Cub Lake before sunrise. Like I always do when its this windy, I checked for some area of water that was partially sheltered from the winds which where forming small white caps on Cub Lake. No such luck, pretty much the entire lake was being raked by the wind. There was one small area near the outlet to the lake which was not as choppy and a little more smooth than directly along the shoreline. Problem is I would have to wade into the mud a foot plus deep water to get in a position to photograph. 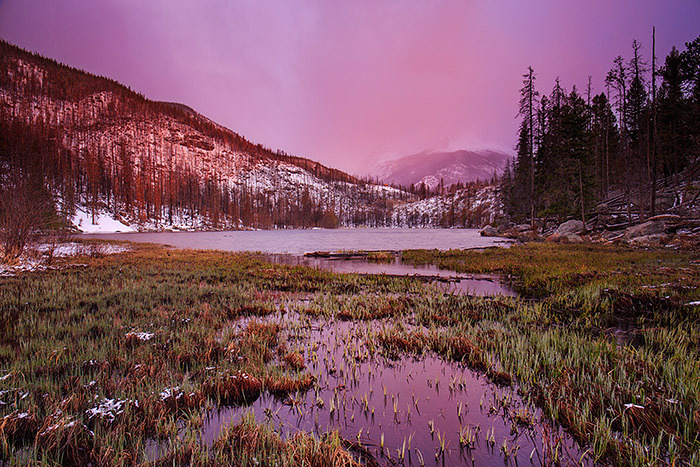 The sky was starting to fill with intense color over Cub Lake. Off I went wading through the mud, muck, water and snow with camera and tripod in hand. I would not be able to capture a reflection of Stones Peak from this location, but the greening grasses growing from the lake made a nice enough foreground. So while the wind only intensified, the light and color put on by the rising sun was well worth wet pants, boots and cold feet. Posted in Colorado, Photography, Rocky Mountain National Park on May 14, 2014 by Tom Mangan. ← Previous: "Rocky’s New Opportunities"